Two years ago I left 100 years of charm and a dream kitchen that I had renovated to perfection for a much larger 6 year old home on the water. Don't get me wrong, I love my new home, but when we first moved in, it looked and felt nothing like me. I also new that it wasn't in the budget to make structural changes so I got to work on the 6 basics that almost immediately made it feel more like me. The great American decorator Elsie De Wolfe once said "I believe in plenty of optimism and plenty of white paint." This was definitely my mantra when we moved. This house was a little dark for my taste so I proceeded to bathe the interior in Benjamin Moore's China White and the exterior brick in BM's Grey Owl. The transformation for me was spectacular. Painting the exterior brick amped up the charm factor and painting the interior gave me a bright, fresh clean slate to decorate. People tend to hold off on window treatments especially if they are starting from scratch. I was lucky enough to be able to use all of my old furniture and it worked really well. So with my neutral walls and fairly neutral color palate, I was able to hit the ground running. It also doesn't hurt that I sew. This is a handy skill when doing any kind of decorating. It is AMAZING how different a space feels when your windows are dressed. Your home will instantly feel warm and inviting . Joni Webb of Cote De Texas blog has a post on Window Treatment Do's and Dont's. It is hands down the best guide I have ever read on the subject. This image is an example of how window treatments can warm up a house from the outside too. The awning edge, roman shades in the dormer windows echo the dental mold detail and add instant curb appeal to the front of this charming cape cod. Whether you have an established collection, treasured family photos or you are starting from scratch, there is no easier way to instantly inject your personality into a space. Surrounding yourself with images of loved ones or artwork that evoke memories is a game changer. Get out your hammer, nails and laser level and hang something on your walls. People seem to hem and haw about where to hang art and photographs. Don't get too stressed. Nail holes are easy to fill and most artwork is fairly portable. I did these silhouettes of my kids and a beloved pet years ago. They were immediately at home over a sofa in my basement. Lighting is one of my favorite things. To me, it's like jewelry for house, a great way to inject my personal style. Often when you move, the fixtures are either contractor grade or express the personality of the family that was there before you. Lighting has the ability to change the mood of a room instantly. Add dimmer switches wherever you can. Now you have the power to set the stage for game night with the kids, cocktails with friends or a romantic evening for two! 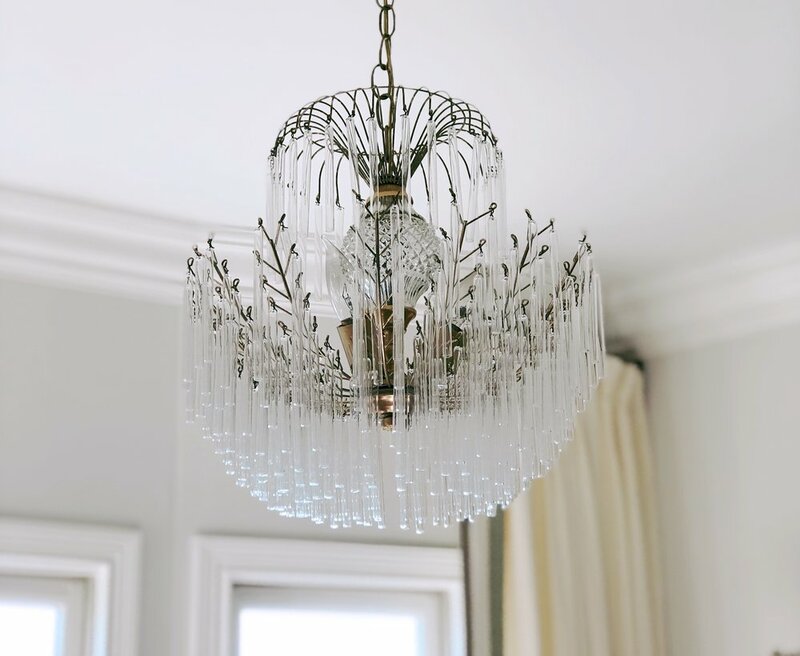 I installed this sweet little chandelier in the sitting area of our master bedroom. If you are trying to add character to a fairly new house consider vintage fixtures. They can be very reasonable, but always have the wiring checked, replaced if necessary and installed by a licensed electrician. Don't underestimate the power of plant life. Plants and flowers literally bring life into your home. You can even purchase beautiful orchids at the grocery store. If planting is intimidating, take a favorite container to your local nursery. Most of them will plant it for you with various house plants that suit your light and location. As long as you keep it watered, you will have a living centerpiece for months. Stay tuned for a future post on creating a living centerpiece. They are beautiful and economical - perfect storm, right? Most of us can't afford to do it all at once. Like Nemo - just keep swimming (I love Nemo) and fix where you will live the most, first. This is the key to making your house feel like home. Don't worry so much about the formal dining or living room, focus on your family room, breakfast room or master bedroom. It's important to feel at home and comfortable where you spend your time. Have fun and enjoy the process! This is your new home. It represents a new chapter in your life, where you will make new memories. Whatever the season of your life, make your home a haven. A place where you can recharge and spend time with family and friends.